Studies have shown that most children don’t see the dentist until they are well over 3 years old, which is much later than recommended by medical professionals. The American Academy of Pediatric Dentistry recommends that a child go to the dentist by age 1 or within six months after the first tooth is cut. It’s important to begin good oral health habits, like visiting the dentist, at a young age to make sure that tooth decay is not occurring. 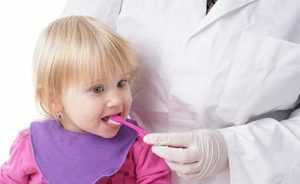 Early preventative dental care for young children can prevent costly dental procedures and also instill good brushing and flossing habits for life. Examine your child’s teeth for early signs of decay, but will also look for problems with the baby’s head, neck and jaws. Your child’s bite, facial growth and development will also be assessed. Demonstrate various tooth brushing and flossing techniques and positions to help parents care for their baby’s teeth properly. Discuss diet and feeding/snacking practices that may put the child at risk for decay. Address the use of topical fluoride. Should my child see a general or pediatric dentist? A general dentist or a pediatric dentist is capable of seeing your child. The difference is that a pediatric dentist’s office is geared toward children and has special décor for children. If your child has special needs, care from a pediatric dentist should be considered. Ask your dentist at Dental365 or your child's doctor what he or she recommends for your child. If your child needs to see a dentist please 844-365-DENTAL to find the Dental365 location nearest you. Our caring dentists will care for your child as if he/she were their own and immediately put any fears your child may have at ease.